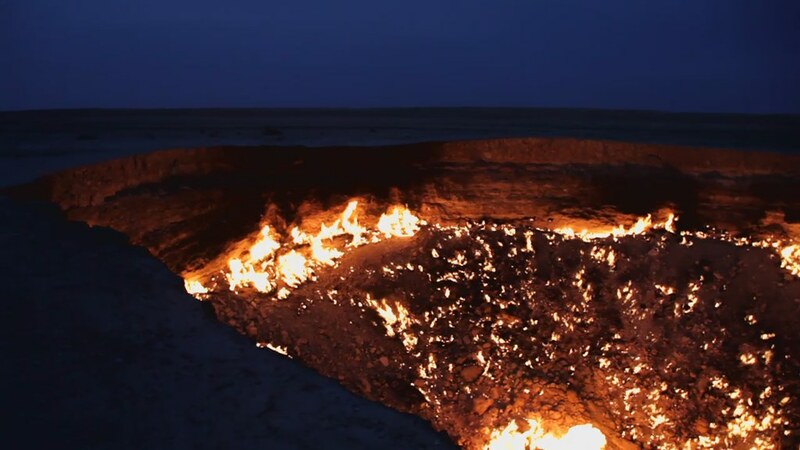 The Door to Hell (gate to hell) is a natural gas field in Derweze, Turkmenistan located in the middle of the Karakum Desert in Central Asia. In 1971, a team of Soviet engineers accidentally drilled through the roof of a natural gas cavern, which collapsed, leaving this crater 70 meters across and around 20 meters deep. Too big to cap, they decided to burn off the gas to make it safe, expecting it to last a few days. It is still burning over 40 years later. The fire is feded by the rich natural gas deposits in the area and the gas reserve found here is one of the largest in the world. The name, “Door to Hell”, was given to the field by the locals, referring to the fire, boiling mud, and orange flames in Derweze’s large crater.